UNHCR has launched a comprehensive data portal on the Mediterranean refugee and migrant situation and the various responses. The portal contains data, statistical information, maps, reports, situation updates, and other information. 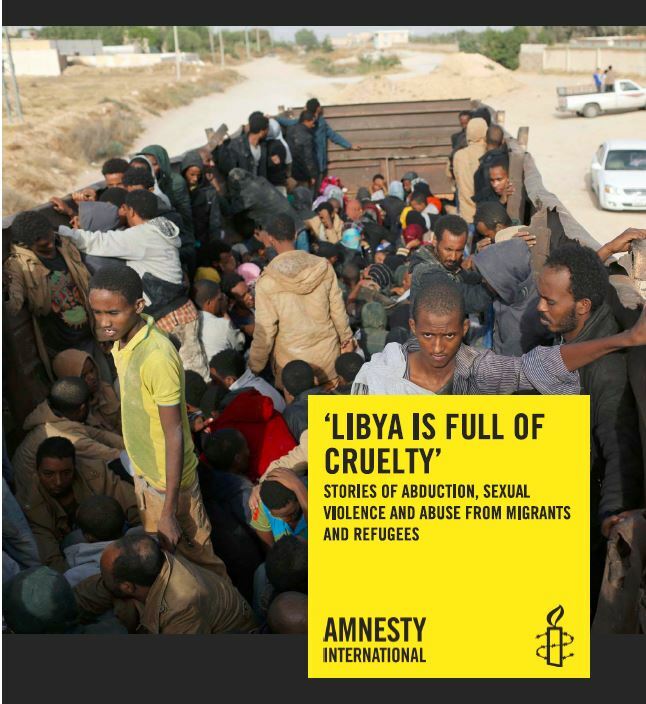 “As more people are drowning in the Mediterranean Sea, the priority for the international community must be to dramatically expand search and rescue operations and take effective steps to urgently address human rights abuses and serious violations of international humanitarian law in Libya. EU governments must also increase the number of resettlement places, humanitarian admissions and visas for people in need of international protection”. Investigate and bring to justice in fair trials those involved in trafficking of persons. Keep the borders open to all individuals in need of international protection regardless of whether they have valid travel documents or meet visa requirements. Ensure that any regional co-operation aimed at addressing irregular migration and dismantle smuggling networks fully complies with international law and standards, and does not infringe upon the rights and safety of asylum-seekers and refugees, with particular regard to the right to freedom of movement, the right to asylum, and the absolute prohibition on refoulement. Last year, the European Union detected the biggest number of illegal border crossings since Frontex data-collection started eight years ago. The record number of 280 000 detections was mainly fuelled by the ongoing fighting in Syria, which has caused the worst refugee crisis since the Second World War. Syrians fleeing their country were the largest group of irregular migrants seeking to enter the EU. 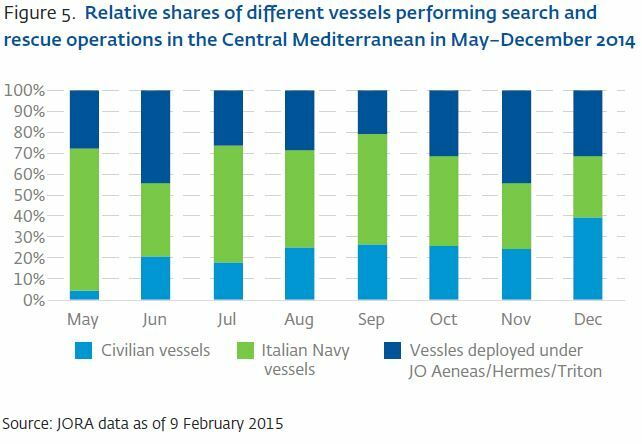 Most of the detections were reported as part of search and rescue operations in the Central Mediterranean area. Although border control authorities continued to save the lives of thousands of people, smugglers increasingly used unsafe boats, putting migrants in greater danger. The unprecedented number of migrants also encouraged facilitators to use cargo ships to smuggle them at a large scale. Starting in September, such vessels took migrants directly from the Turkish coast near Mersin to Italy. This is a multi-million-euro business for organised crime groups, which is likely to be replicated in other departure countries. Another trend explained by the Frontex risk analysis experts has been the increasing number of deliberate attempts to involve merchant ships in rescuing migrants. This has prompted the International Maritime Organization (IMO) to voice the concerns of the shipping industry over its involvement in rescuing migrants. 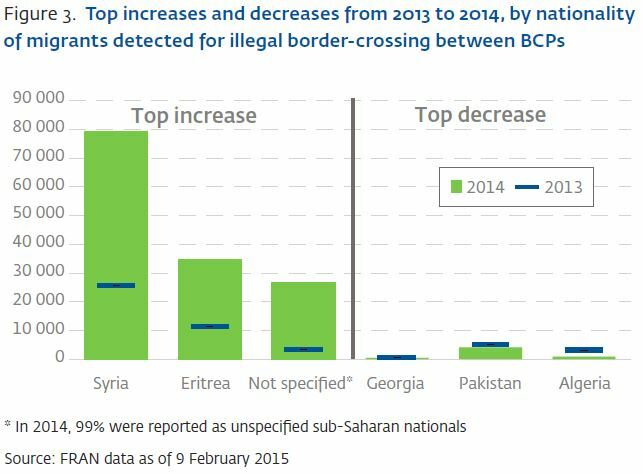 The profile of detected irregular migrants remained relatively unchanged compared to 2013. They are mostly adult males, although the proportion of women (11%) and children (15%) reflects the fact that many migrants intend to claim asylum. More than 60% (170 000) of all illegal border crossings were detected in the Central Mediterranean. On the second most frequented route in the Eastern Mediterranean covering borders of Greece, Bulgaria and Cyprus, there were more than 50 000 detections. Near the end of 2014, detections increased sharply at the Hungarian land border with Serbia, making the Western Balkan route the third most important irregular migration route with more than 43 000 detections. Detections of migrants hidden in vehicles seeking to enter the EU via regular border crossings surged to over 3 000, five times the number from the previous year. This jump was due to a tenfold increase in detections reported from the Bulgarian border crossings along the land border with Turkey. 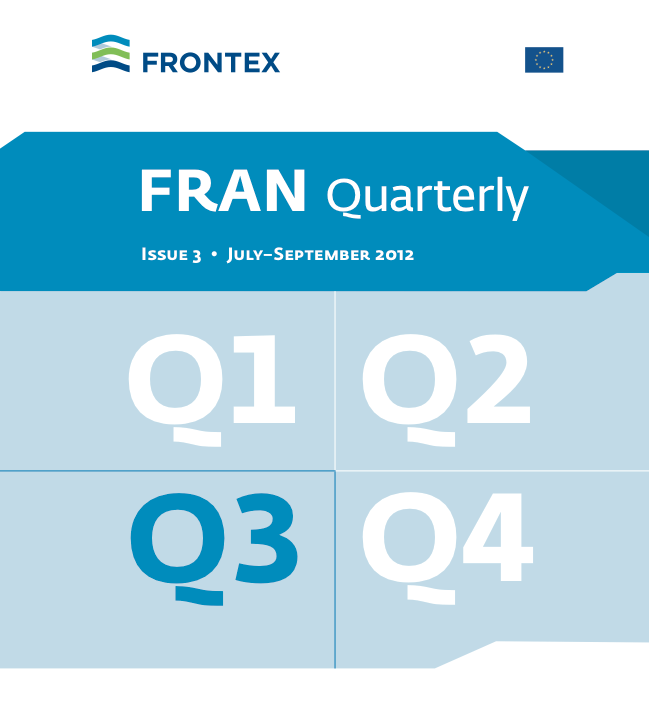 In July of this year, Frontex released its first quarter (January – March) 2013 report. As in past quarters, the 70-page report provided in-depth information about irregular migration patterns at the EU external borders. The report is based on data provided by 30 Member State border-control authorities, and presents results of statistical analysis of quarterly variations in eight irregular migration indicators and one asylum indicator (here is a link to our summary of the 2012 fourth quarter report). The Greek operation Aspida (see the 2012 Q4 summary for details) has resulted in a dramatic reduction of irregular migration across the Greek-Turkish border. As a result, one of the three alternative routes increasingly utilized is: migrants leaving the west coast of Turkey to illegally cross the Eastern Aegean Sea towards the Greek Islands. This border section ranked second at the EU level in terms of detections. Syrians and Afghans were both detected at similar frequencies of around 500 each over the three-month period. The JO Poseidon Sea 2012 was also active during the reporting period in order to tackle the flow of irregular migrants penetrating the external EU sea borders in the Eastern Mediterranean mainly from Turkey and, to a lesser extent, from Egypt. Syrians, were increasingly detected at the Greek sea border with Turkey (Eastern Aegean Sea) and the Bulgarian land border with Turkey. 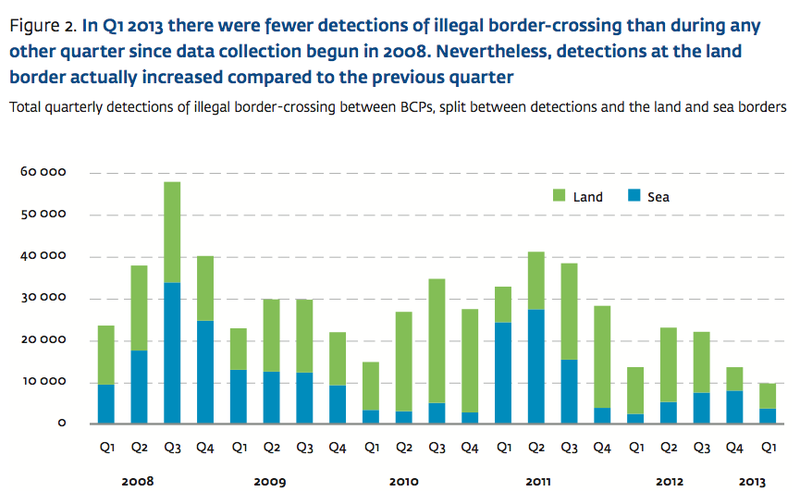 There were fewer detections of illegal border-crossing than ever before, with just 9 717 detections. The drop was limited mostly to sea borders.The JO Poseidon Land 2012 was active during Q1 2013. In the Eastern Mediterranean, detections tend to be characterised by Asian and some North African migrants illegally crossing the border from Turkey into Greece. 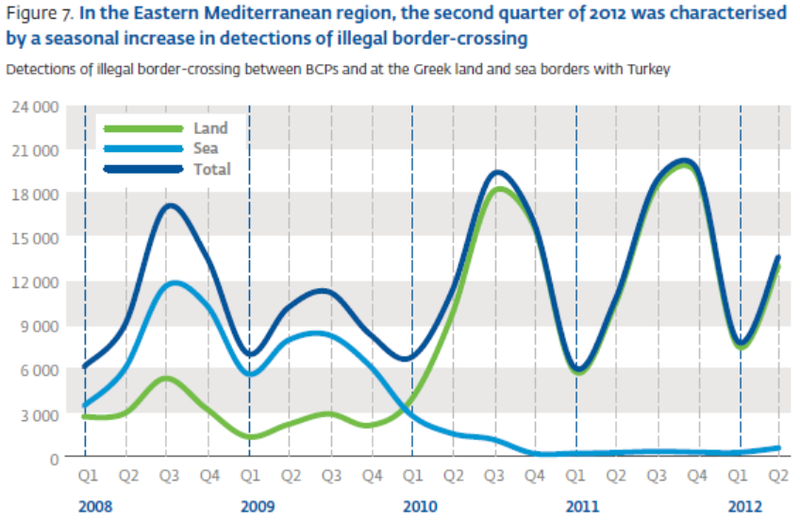 In the second half of 2012 detections were much reduced following increased operational activity at the Greek land border with Turkey, where most detections were previously reported (see Section 4.1.1.). On the main Central Mediterranean route, which includes the Italian Pelagic Islands (Linosa, Lampione and Lampedusa) and Malta, most detections tend to be of migrants arriving on boats from North Africa. 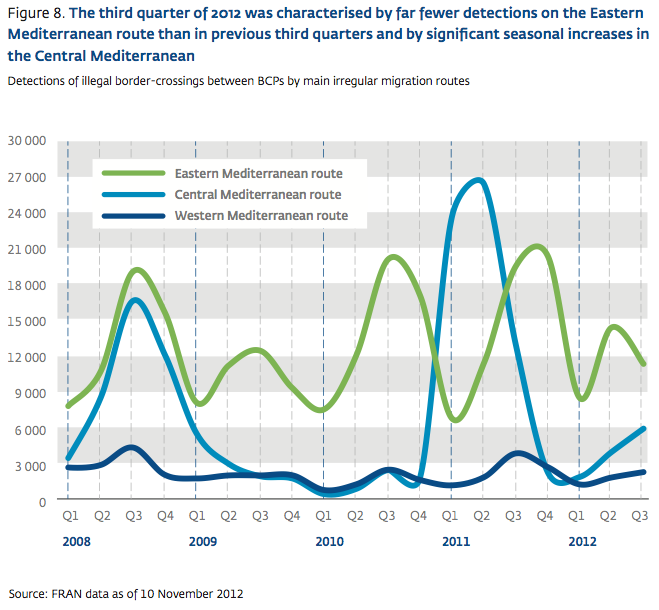 During the previous quarter there were fewer detections of North African nationalities such as Tunisians and Egyptians but there was a surge of migrants from sub-Saharan countries such as Eritrea, the Gambia and Mali, all of which were detected in much higher numbers during the last there months of 2012 compared with Q3 2012. In the current reporting period, the number of detected Somalis decreased, resulting in the top three nationalities – Somalis, Gambians and Egyptians– being detected at similarly low levels of around 200–250 each over the three-month period (Fig. 5). 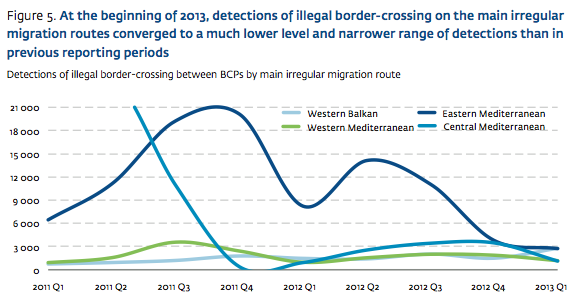 In Q1 2013 there were 2 734 detections of il- legal border-crossing on the Eastern Mediterranean route, which was a decrease of 66% compared to the same period in 2012 but nevertheless still constituting nearly 30% of all detections at the EU level. In effect, this route remained the major entry point to the Schengen area. With nearly 1 000 detections in Q1 2013, Syrians were by far the most detected nationality on this route. More than half of these detections were in the Eastern Aegean Sea region, with significant numbers also at the Bulgarian land border with Turkey. 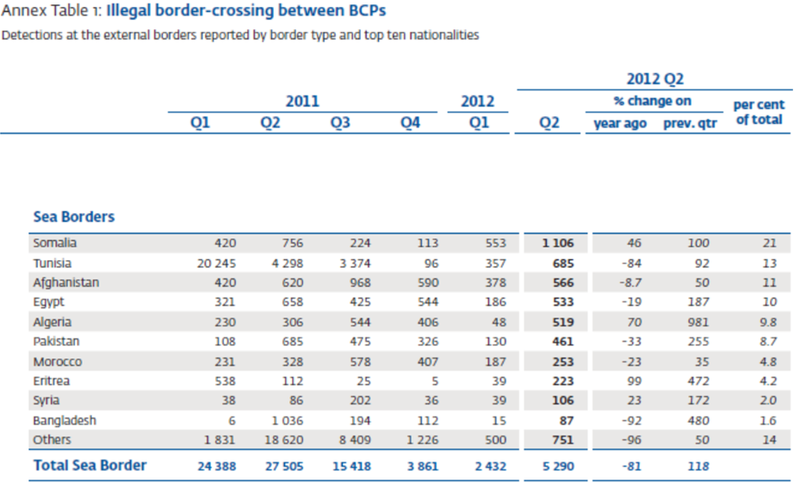 This border section ranked second at the EU level in Q1 2013. The most frequently detected migrants were Syrians and Afghans, followed Sri Lankans, whose number has recently increased. The JO Poseidon Sea 2012 was operational throughout the reporting period, focusing on tackling the flow of irregular migrants penetrating the external EU sea borders in the Eastern Mediterranean mainly from Turkey and, to a lesser extent, from Egypt. Syrians have been the most commonly detected migrants during the operation so far in 2013. Most were men travelling alone but here were some family units, and all were heading for Sweden or Germany to claim asylum. Once they entered Turkey, those intending to enter the EU travelled to Istanbul in order to make contact with facilitation networks. They stayed in Istanbul for between 1–12 weeks before being taken by van to the west coast of Turkey to depart towards the Greek eastern Aegean Islands. Afghans were also detected in this region. Most were previously resident in Iran and had decided to travel to the EU due to deteriorating employment conditions. The Afghan community in Iran can easily find criminal networks that can facilitate them to Turkey and then to Greece. Once in Turkey, the Afghan migrants were transported by public transport to Istanbul and from there mainly by private transportation directly to departure area on the western coast of Turkey, where they boarded rubber boats destined for the Greek eastern Aegean Islands. Since early 2011 migrants from Tunisia have been among the most commonly detected migrants arriving in the Central Mediterranean region but during the first three months of 2013 only 75 Tunisians were detected. In fact nearly all of the top 10 nationalities in Q1 2013 were detected in much lower numbers than during the final quarter of 2012. Migrants from Somalia ranked top in the region but were detected at their lowest level for over a year. A total of 233 migrants from the Gambia were detected in the Central Mediterranean during Q1 2013 which is the highest ever level for this nationality resulting in them ranking second in this region, followed by 216 Egyptians. The JO Hermes 2012 was operational just for the first month of the reporting period. The operation was established to support the Italian authorities in tackling maritime illegal migration on the coasts of Sicily, Pantelleria and the Pelagic Islands (Lampedusa, Linosa, Lampione). In January 2013, there was only one incident reported under JO Hermes whereby a total of 35 irregular migrants were detected, 32 of which were Syrian and three were Egyptian. [***] The disembarkation point was near Syracuse but this time the interception took place inland, implying that the facilitators (and probably some migrants) evaded detection. The absence of boats from Tunisia and Libya may be due to the bad weather conditions throughout the Mediterranean area. Although FRAN data suggest that detections of migrants from Syria were low in this region during the first three months of 2013 (85), there were some reports of boats arriving directly from Syria. 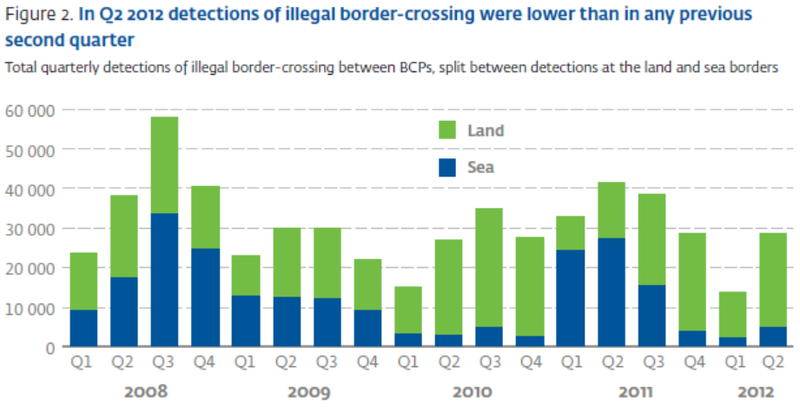 In Q1 2013 there were only around 1 000 detections of illegal border-crossing in the Western Mediterranean region, which consists of several areas of the southern Spanish coast as well as the land borders of Ceuta and Melilla, where three-quarters of all detections were reported. At the end of 2012 we reported vastly increased detections of migrants from Chad, Cameroon, Mali and Guinea arriving in the region of Cadiz but this did not continue into the first few months of 2013. Analysing the nationalities detected on this route is problematic as half were reported by the Spanish authorities as being of unknown nationality. However, open sources suggest that there have been increased reports of African migrants storming the border fence in Melilla. 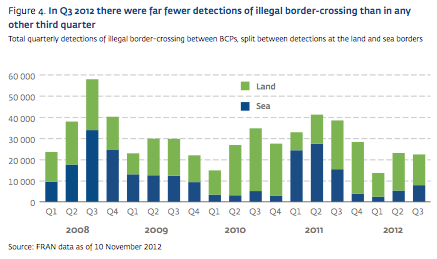 In the first quarter of 2013, there were just a few individual detections of illegal border-crossing in this region, which is the same level as during the same period in 2012. During the previous quarter there were 30 or so detections of both Gambians and Moroccans but neither of these nationalities were apparent in the data exchanged for the first three months of 2013. Hence irregular migration pressure on the Western African route in much reduced. Click here for a copy of the report. maintain a moratorium on returns to Greece of asylum seekers under the Dublin Regulation. The Resolution was supported by a Report prepared by Ms Tineke Strik, Rapporteur, PACE Committee on Migration, Refugees and Displaced Persons. Click here for full text of Resolution 1918(2013), Migration and asylum: mounting tensions in the Eastern Mediterranean. Click here for PACE press statement. Click here for Report by Rapporteur, Ms Tineke Strik, Doc. 13106, 23 Jan 2013. Europe must drastically rethink its approach to responsibility sharing to deal with what is a European problem and not one reserved to a single or only a few countries. Member States are called on to substantially increase their support for Greece, Turkey and other front-line countries to ensure that they have a realistic possibility of dealing with the challenges that they face. In this the Council of Europe also has a role to play, for example through exploring resettlement and readmission possibilities, assisting States in dealing with their asylum backlogs and putting forward innovative projects to alleviate growing racism and xenophobia towards migrants, refugees and asylum seekers. 2. Greece is facing a major challenge to cope with both the large influx of mixed migratory flows, including irregular migrants, refugees and asylum seekers, and the current economic crisis. That said it is not the only country struggling to cope in the region. It is impossible to look at the situation of Greece without also examining that of Turkey, which is the main country of transit to Greece and is also having to shoulder responsibility for over 150 000 Syrian refugees. 3. In the light of the foregoing, it is necessary to examine the extent of the migration and asylum challenges at Europe’s south-eastern border, taking into account Turkey and Greece’s policy reactions. Two further elements have to be added to this, namely the social tensions arising within Greek society due to an overload of financial and migratory pressure and also the issue of shared responsibility in Europe for dealing with European as opposed to simply national problems. 4. In recent years, hundreds of thousands of irregular migrants, asylum seekers and refugees crossed the Greek land, river and sea borders with many travelling through Turkey. In 2010, the large majority of mixed migratory flows entered the European Union through the Greek-Turkish border. This situation brings major challenges in terms of human rights and migration management. 5. According to statistics provided by the United Nations High Commissioner for Refugees (UNHCR), in 2010, more than 132 000 third-country nationals were arrested in Greece, including 53 000 in the Greek-Turkish border regions. During the first ten months of 2012, over 70 000 arrests occurred, including about 32 000 at the borders of Turkey. People came from 110 different countries – the majority from Asia, including Afghanis, Pakistanis and Bangladeshis, as well as from Iraq, Somalia, and the Middle-East, especially Palestinians and an increasing number of Syrians. 6. Most migrants and asylum seekers do not want to stay in Greece and plan to continue their journey further into Europe. Many of them are however stuck in Greece, due to border checks and arrests when trying to exit Greece, the current Dublin Regulation, and the fact that many irregular migrants cannot be returned to their country of origin. 8. In its Resolution 1902 (2012) on “The European response to the humanitarian crisis in Syria”, the Parliamentary Assembly condemned “the continuing, systematic and gross human rights violations, amounting to crimes against humanity, committed in Syria”. It described the humanitarian situation as becoming “more and more critical” for the estimated 1.2 million internally displaced Syrians and the 638 000 Syrians registered or awaiting registration as refugees in neighbouring countries. 11. By October 2012, 23 500 Syrian nationals had applied for asylum in EU member States, including almost 3 000 applications in September 2012 alone, and over 15 000 in Germany and Sweden. Compared to neighbouring countries, asylum seeker numbers in the European Union currently remains manageable. However the number of Syrians trying to enter Greek territory in an irregular manner reached a critical level in July 2012, when up to 800 Syrians were crossing the Greek-Turkish land border every week. 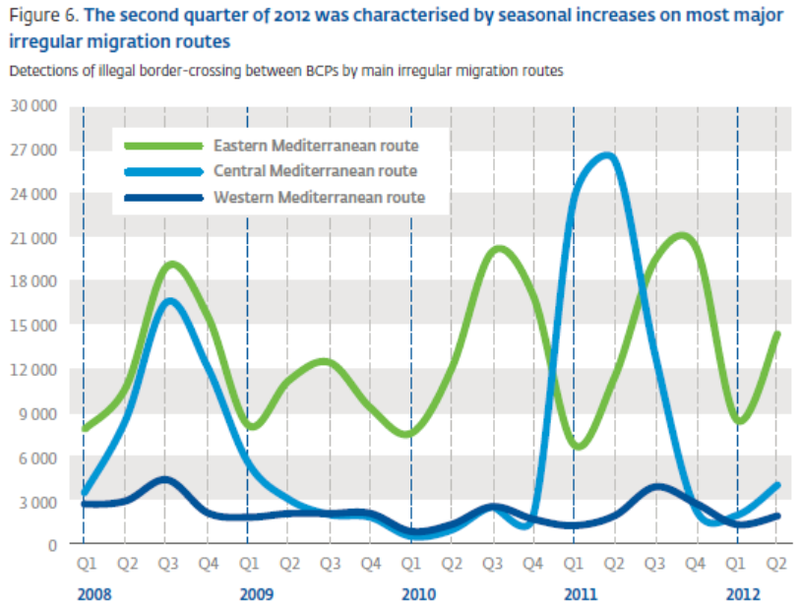 In the second half of 2012, more than 32% of sea arrivals to the Greek Islands were Syrian nationals. 12. In recent years, Spain, Italy and Malta were at the forefront of large-scale sea arrivals. According to the UNHCR, in 2012, 1 567 individuals arrived in Malta by sea. 75% of these persons were from Somalia. The UNHCR estimates however that less than 30% of the more than 16 000 individuals who have arrived in Malta since 2002 remain in Malta. 13. Spain and Italy have signed and effectively enforced readmission agreements with North and West African countries cutting down on the mixed migration flows. These agreements have provided the basis for returning irregular migrants and preventing their crossing through increased maritime patrols and border surveillance, including in the context of joint Frontex operations. 14. As a consequence of shifting routes, migratory pressure at the Greek-Turkish border increased significantly and Greece became the main gate of entry into the European Union from 2008 onwards, with an interval in 2011 when the Arab Spring brought a new migratory flow to Italy and Malta. 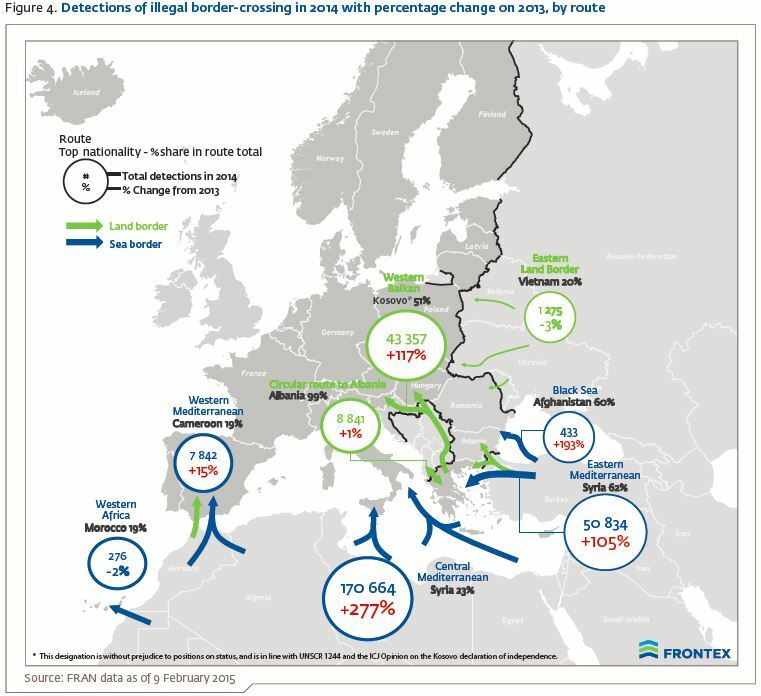 To give an idea of how much the routes have changed, Frontex indicated that in 2012, 56% of detections of irregular entry into the European Union occurred on the Greek-Turkish border. 15. Turkey, by contrast, has become the main transit country for migrants seeking to enter the European Union. Its 11 000-km-long border and its extensive visa-free regime make it an easy country to enter. An estimated half a million documented and undocumented migrants currently live in the country. This has brought a whole new range of challenges for Turkey and meant that it has had to develop a new approach to migration management and protection for those seeking asylum and international protection. It has also faced problems in terms of detention of irregular migrants and asylum seekers. As with Greece, the conditions of detention have been highly criticised and steps are being taken to build new centres with the assistance of funding from the European Union. 16. Until recently, the traditionally complex Greek-Turkish political relations did not allow the pursuit and consolidation of an effective readmission policy with Turkey. Although Greece, for example, signed a readmission protocol with Turkey which goes back to 2001, the implementation of this was only agreed on in 2010. It is important that this bilateral agreement between Greece and Turkey functions effectively and this will be a challenge for both countries. 3. Shielding Greece through border management and detention: does it work? 17. The unprecedented numbers of irregular migrants and asylum seekers attempting to cross the Greek-Turkish border in recent years put the existing capacities and resources of Greece under severe strain. To remedy this situation, the Greek authorities have adopted the “Greek Action Plan on Asylum and Migration Management”, which is the basis for reforming the asylum and migration management framework in Greece. 18. In this context, considerable efforts were undertaken to reinforce Greece’s external borders and particularly the Greek-Turkish border in the Evros region. This was done notably through building up operational centres, using electronic surveillance and night vision devices, and by deploying patrol boats to strengthen river patrols. The surveillance technology used is part of the efforts under the European Border Surveillance System (Eurosur). 19. The so-called operation “Aspida” (“shield”), initiated in August 2012, aims to enhance border controls, surveillance and patrolling activities at the Greek-Turkish land border. Approximately 1 800 additional police officers from across Greece were deployed as border guards to the Evros region. 20. Increased border controls in the context of this operation have not been without criticism. There have been worrying reports about migrants, including refugees and asylum seekers from Syria and other countries, being pushed back to Turkey over the Evros river. Two incidents reportedly took place in June and October 2012, when inflatable boats were intercepted in the middle of the Evros river by Greek patrol boats and pushed back to Turkey before their boat was sunk, leaving people to swim to the Turkish shore. 21. In addition, the Greek authorities completed a barbed wire fence at the 12.5-km-land border in December 2012. The barrier which was criticised by EU officials when announced and built without EU funding, cost an estimated 3 million euros. 22. As a consequence of these actions, the numbers of irregular land border crossings dropped from over 2 000 a week in the first week of August to below 30 a week in the second half of September. According to the regional governor of Eastern Macedonia and Thrace, they are now close to zero. While the Greek authorities claim that these actions have resulted in a more than 80% decrease of irregular entries, one can observe that migrants’ routes have shifted from the Greek-Turkish land border mainly to the sea border between both countries. This shift has been recognised by the Greek authorities. 23. Increased numbers of migrants are now arriving on the Greek Aegean islands of Lesvos, Samos, Symi and Farmkonissi. Between August and December 2012, 3 280 persons were arrested after crossing the Greek-Turkish sea border, compared to 65 persons in the first seven months of 2012. 24. There has also been an increase in the number of deaths at sea. In early September 2012, 60 people perished when their boat sank off the coast in Izmir. On 15 December 2012, at least 18 migrants drowned off the coast of Lesvos while attempting to reach the island by boat. 25. The spill over effect of new routes opening are now being felt by neighbouring countries, such as Bulgaria and some of the Western Balkans. 29. Particularly worrying are the conditions in the various detention centres and police stations where irregular migrants and asylum seekers are held, and which have frequently been criticised. The European Court of Human Rights has found Greece to be in violation of the right to freedom from inhuman or degrading treatment in several cases in recent years. In addition, the European Committee for the Prevention of Torture and Inhuman or Degrading Treatment and Punishment (CPT) has regularly criticised the poor detention conditions of irregular migrants and asylum seekers and the structural deficiencies in Greece’s detention policy as well as the government’s persistent lack of action to improve the situation. See also: CPT, Report on its visit from 19 to 27 January 2011, published on 10 January 2012, at: www.cpt.coe.int/documents/grc/2012-01-inf-eng.pdf, together with the reply by the Greek authorities, at: www.cpt.coe.int/documents/grc/2012-02-inf-eng.pdf. The conditions of detention in one centre in Greece were found to be so bad that a local court in Igoumenista acquitted, earlier this year, migrants who were charged with escaping from detention stating that the conditions in the centre were not in compliance with the migrants’ human rights. 35. Despite the current efforts by the Greek authorities to reform the asylum and migration management framework, the country still does not have a fair and effective asylum system in place. The Greek Action Plan on Migration and Asylum, which was revised in December 2012, sets out the strategy of the Greek Government. It foresees the speedy creation of a functioning new Asylum Service, a new First Reception Service and a new Appeals Authority, staffed by civil servants under the Ministry of Public Order and Citizens Protection, disengaging the asylum procedure from the police authorities. However problems in finding sufficient financial resources and qualified staff still give rise for concerns on the implementation of the plans. 46. The mounting social tensions and the inadequate response by the State to address the difficult social situation of migrants, asylum seekers and refugees have led to an increase in criminality and exploitation of this group. In addition, migration has become a key confrontational political issue. This in turn has contributed to an increasingly wide-spread anti-immigrant sentiment among the Greek population. 47. Over the last two years there has been a dramatic increase in xenophobic violence and racially motivated attacks against migrants in Greece, including physical attacks, such as beatings and stabbings, attacks on immigrants’ residences, places of worship, migrants’ shops or community centres. The Network for Recording Incidents of Racist Violence documented 87 racist incidents against migrants and refugees between January and September 2012. Half of them were connected with extremist groups. 48. Members and supporters of Golden Dawn have often been linked with recent violent attacks and raids against migrants and asylum seekers. By using blatantly anti-migrant and racist discourse, often inciting violence, Golden Dawn gained 7% of the popular vote during the June 2012 parliamentary elections and support seems to be growing, according to recent polls. In October 2012, the Greek Parliament lifted the immunity from prosecution of the two Golden Dawn MPs who participated in the violent attacks against migrants in September. 49. The Council of Europe Commissioner for Human Rights has called on Greece to examine whether the “most overt extremist and Nazi party in Europe” is legal. It seems that Golden Dawn aims at political and societal destabilisation and gains by the failing policy regarding refugees and irregular migrants. In December 2012, the European Commission against Racism and Intolerance (ECRI) expressed its “deep concern” about the rise of Golden Dawn and asked the Greek authorities to “take firm and effective action to ensure that the activities of Golden Dawn do not violate the free and democratic political order or the rights of any individuals”. 50. This is not the first time that the Parliamentary Assembly expresses its concern on the particular pressure that European front-line States are confronted with. Resolution 1521 (2006) on the mass arrival of irregular migrants on Europe’s Southern shores, Resolution 1637 (2008) on Europe’s “boat people”: mixed migration flows by sea into southern Europe and Resolution 1805 (2011) on the large-scale arrival of irregular migrants, asylum seekers and refugees on Europe’s southern shores. 51. Despite the fact that most European Union countries have stopped returning asylum seekers to Greece under the Dublin Regulation following the judgment of the European Court of Human Rights in the case M.S.S. v. Belgium and Greece, there are still some reports of returns from some countries based on this regulation. 52. The final agreement between the Council and the European Parliament on the revision of the Dublin Regulation still allocates responsibilities for asylum seekers to a single EU member State and does not present a more fundamental reform of the rules. European Union member States also rejected the idea of a mechanism to suspend transfers to those EU countries which were unable to manage the influx of asylum seekers into their territory, preferring to adopt an “early warning mechanism”. 53. This migratory pressure Greece is confronted with comes at a moment when the country is suffering as no other European country does from the current economic and social crisis. In response to these difficulties, the European Union has provided financial and technical assistance. 54. During the period of 2011-2013, Greece received 98,6 million euros under the Return Fund, 132,8 million euros under the External Border Fund and 19,95 million euros under the European Refugee Fund. The focus of funding was thus on border control and detention measures, to the detriment of the protection measures. 55. Frontex Joint Operation “Poseidon Land” was launched in 2010 at the borders between Turkey and Greece and between Turkey and Bulgaria. EU member States currently have 41 police officers and equipment deployed to the Evros border region in Greece. They also support the Greek and Bulgarian authorities with the screening and debriefing of irregular migrants, and tackling irregular migratory inflows and smuggling networks towards Greece. In addition, Frontex has recently strengthened its patrols in the coastal waters in the Eastern Aegean between Greece and Turkey in the context of Joint Operation “Poseidon Sea”. European Union member States have deployed additional maritime surveillance assets at the sea border between Greece and Turkey. The joint operation was extended to also cover the West coast of Greece and today is Frontex’s main operational activity in the Mediterranean region. 56. Furthermore, the European Asylum Support Office (EASO) provides technical support to Greece and other EU member States whose asylum and reception systems are under particular pressure. Following the request by the Greek Government in February 2011, EASO started giving assistance and training in building up a new asylum system, improving reception conditions of asylum seekers in Greece and clearing the backlog of outstanding asylum claims. To do this they have deployed over 40 Asylum Support Teams of experts to the country. 57. While EU member States are ready to provide financial and technical assistance to help Greece in managing and controlling its borders, with a focus on both forced and voluntary returns as a policy solution, they are not keen on sharing the reception and processing of mixed migratory flows arriving at the European Union’s external border. According to the Greens/European Free Alliance of the European Parliament, “[m]igration will not be stopped by reinforcing border control, border management measures and forced returns; the current approach only reinforces human rights violations”. 58. As rapporteur I would largely agree with this statement, although I would add that while such policies may be able to solve a problem in one country, it then simply “passes the buck” to another. Should it be possible to seal Greece’s border, this would undoubtedly then put even greater pressure on Turkey and Bulgaria and then up the eastern borders of the European Union. This is an issue which will be the subject of a separate report by the Committee on Migration, Refugees and Displaced Persons. 59. The European Union response to the economic and financial crisis in Greece has been a massive bail out. Similar solidarity is however necessary with regards to the current social and humanitarian crisis in the field of migration and asylum. Europe is however doing too little, too late. A shared asylum policy that takes into account that the migratory pressures are not the sole responsible of one or a few European States, but a European problem, is even more essential in a time when the region is facing major instability. This instability will only increase further if the up and coming Golden Dawn party succeeds in exploiting the immigrant issue. Europe cannot afford to look away. 60. Increased migratory flows to European front-line States requires a fundamental rethink on solidarity and responsibility sharing. This includes swift solutions that go beyond mere financial and technical assistance and show greater solidarity in receiving refugees and asylum seekers and developing resettlement, especially currently for Syrian refugees from the neighbouring countries of Syria, and intra-EU relocation programmes, in particular where children and families are concerned. Assembly Resolution 1820 (2011) on asylum seekers and refugees: sharing responsibility in Europe provides meaningful recommendations in this respect. 61. The pressure of mixed migratory flows currently unfolding at the European Union’s external borders in the eastern Mediterranean requires rethinking of the entire solidarity system with the European Union and the Council of Europe. Greece, Turkey or other neighbouring countries should not be left with the primary responsibility of dealing with the mounting mixed migratory pressure from the South and East. A shared asylum and migration policy is even more essential at a time when the region is facing major economic and social instability. 62. Stricter border control, prolonging migrants’ and asylum seekers’ detention or constructing new detention facilities in Greece all contribute to further human rights violations taking place. They are not the way out of the problem and they do not persuade people fleeing from poverty or violence in their countries of origin to remain at home. 63. The recent efforts by the Greek authorities to introduce a more effective and humane system addressing the large number of irregular migrants and asylum seekers entering Greece is a welcome step in the right direction. Greece however faces a Herculean task in building up an efficient, fair and functioning system providing international protection to those in need. 64. Europe urgently needs to join forces to deal with the Syrian refugee problem, offering resettlement and relocation to relieve the burden falling on neighbouring States of Syria as well as its southern European States, and ensuring that Syrian refugees are not sent back. 65. The challenges are great but not insurmountable for Europe. Left to individual States they are. 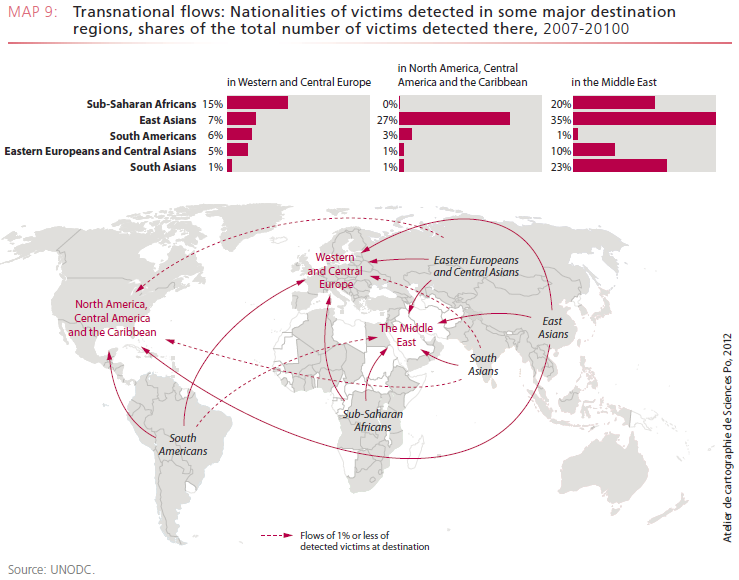 “Of the [trafficking] victims originating outside Europe, those from African countries are most prominently detected. About 18 per cent of the total number of victims detected in Western and Central Europe are African. Victims from West Africa, especially but not only Nigerians, comprise the vast majority. West Africans accounted for about 14 per cent of the total number of victims detected here…. In terms of trends, the proportion of West African victims among the total number of victims detected remained constant in Western and Central Europe during the reporting period. A detailed analysis at the country level, however, shows that a decreasing number of West African victims have been detected in a series of countries, while an increasing number have been detected in others. During the reporting period, fewer West African victims were detected in France and Italy, while they were increasingly detected in Austria and Germany. Similar contrasting trends can be noted among other destination countries in Western and Central Europe. The aggregated regional value is the result of compensation between opposite trends. This may indicate that the West African trafficking flow within the subregion may face some sort of displacement of destination. Click here for links to the Executive Summary and Country / Regional profiles. The UN Special Rapporteur on the human rights of migrants, Prof. François Crépeau, has completed a nine-day official visit to Greece, the fourth and last country visit in connection with a “a one-year comprehensive study to examine the rights of migrants in the Euro-Mediterranean region, focusing in particular on the management of the external borders of the European Union.” The Special Rapporteur will present a thematic report on the human rights of migrants at the borders of the European Union to the UN Human Rights Council in May/ June 2013. In addition to the visit to Greece, he previously conducted official visits to EU offices in Brussels, Tunisia, Turkey, and Italy. Click here for complete End-of-Mission Statement. Click here for my previous post on the Special Rapporteur’s visits to other countries.